This here is a story about bees, notoriously hard workers. Older bees, that is, which go and take on responsibilities usually doled out to the younger, stronger bees. When you look at the effects on the brains of these older bees, a picture emerges that could have huge effects for people. Another health breakthrough for dementia, anyone? Arizona researchers discovered that older honey bees reversed brain aging when they took on nest responsibilities usually reserved for much younger bees. In essence, tricking older, foraging bees into doing social tasks inside the nest causes changes in the molecular structure of their brains. For humans, this suggests that social interventions may be used to slow or treat age-related dementia. In the study, scientists removed all of the younger nurse bees from the nest — leaving only the queen and babies. When the older, foraging bees returned to the nest, activity diminished for several days. Then, some of the old bees returned to searching for food, while others cared for the nest and larvae. After 10 days, about 50% of the older bees caring for the nest and larvae had significantly improved their ability to learn new things. 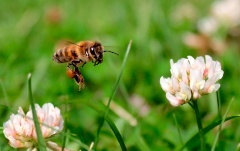 There was not only a recovery in the bees’ ability to learn, but also a change in proteins in their brains. Researchers found “Prx6,” a protein also found in humans that could help protect against dementia — including diseases such as Alzheimer’s — and they discovered a second protein that protects other proteins from being damaged due to cellular stress. In clinical science right now, most research is focusing hard on developing a drug that could help people maintain brain function. This is a long way off…perhaps up to 30 years down the road. For now, there are perfectly natural steps we can take. Perhaps social intervention — changing how one deals with their surroundings — is something we can do today to help our brains stay younger. The proteins mentioned in the study are the very same that exist in our brains. They may be able to spontaneously respond to specific social experiences. This adds to a growing body of research that shows we have much power in preventing the ravages of dementia ourselves. Keeping a healthful diet, exercising regularly, testing the brain by reading, doing crossword puzzles and other tasks, and being social with others can help keep us young. And free from illnesses that steal memory and brain function.